The most heavily polluting lorries are facing charges of £200 per day to enter Greater London as Britain's first low emission zone (LEZ) comes into force. The £49m scheme uses cameras to check all lorries over 12-tonnes entering the zone against a database of vehicles certified as meeting EU exhaust limits. Firms whose vehicles are not on the database will be told to pay up. The rules, aimed at improving London's air quality, will be extended to cover buses and coaches in July. By 2010, it will also cover some vans and smaller lorries. Cars and motorcycles are exempt. Firms are responsible for making sure their vehicles comply with the anti-pollution rules, which stipulate the amount of airborne dirt and nitrogen oxide each vehicle is permitted to emit. Unlike London's congestion charge zone, which is lifted in the evenings and at weekends, the LEZ will be in force 24 hours a day, every day. It also covers a larger area of 610 sq miles (1,580 sq km). Failing vehicles will be issued with a warning letter the first time they are seen in the zone. In response to claims not enough was being done to make haulage companies aware of the new requirements, firms have been given an extra 28 days from the launch of the zone to ensure their vehicles comply before the fines kick in. Firms which fail to pay the £200 charge will be fined £1,000. 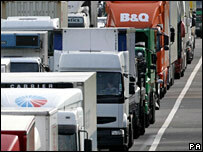 Hauliers have protested about the new rules, which they say will be expensive to comply with. But Transport for London, which is implementing the zone, says it will improve quality of life for people with asthma, cardio-vascular disease and other health conditions. Nick Fairholme, head of the LEZ, said: "Despite significant improvements in recent years, London's air pollution is the worst of any city in the UK and among the worst in Europe. "The LEZ aims to reduce traffic pollution by deterring the most individually polluting diesel-engine lorries, buses, coaches, minibuses and large vans from driving within our city." All lorries made after October 2001 automatically comply with the EU standards of particulate emissions of 0.05g per km. Older vehicles can be adapted to comply with the rules. TfL said it had identified 120,000 lorries of over 12 tonnes inside the zone during six months of monitoring last year and estimates that about 10% do not meet EU standards. Low emission zones are already planned or in operation in 70 towns and cities in eight European countries including Norway, the Netherlands and Germany. BBC transport correspondent Tom Symonds says other UK towns and cities with pollution problems will be watching the implementation of the LEZ with interest.